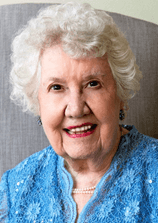 Phyllis Gene Radovich Dishman Vaughan passed peacefully on March 17, 2018 at the age of 91. Born in Hereford, Texas on August 5, 1926, she grew up during the Great Depression and the Dust Bowl. She attended Texas State College for Women (now TWU) and received her degree in journalism in 1947. While there, she joined Theta Sigma Phi (Women in Communications) and was an active member for 55 years. To put herself through college, Phyllis worked at the Italian P.O.W. camp in the Panhandle during WWII. She was a true Texas pioneer woman. Officially, because she attended TWU, and professionally, as she was the first woman in Texas to host a regularly broadcast radio show. She was also a writer for the Austin-American Statesman, The Dallas Times Herald, The Dallas Morning News, and Women’s Wear Daily. She was an active member of the Press Club Dallas and contributed to their annual Gridiron Show. Her father was an emigrant from what is now Montenegro who owned a café in Hereford, and her mother was a school teacher. Although she was an only child, she and her cousin, Patty Ball, were best friends throughout their entire lives. She married Paul Lake Dishman, Jr. on Christmas Eve, 1950 in Hereford. They subsequently moved to Austin and then settled in Dallas. She loved being a Dallasite and everything about Big D, except the traffic. Together, Paul and Phyllis raised two children. She was a member of Walnut Hill United Methodist Church for 54 years and loved the Harmony Sunday School class. Paul passed away in 1982. In 1996, she married Sam Vaughan, who she met at church. They were married until his death in 2012. She was known as “Eldie” to her grandchildren and great-grandchildren. She is survived by a daughter, Jessica Johnston (Mark); and a son Paul (Chip) Dishman (Beth Lynn); four grandchildren Lake Dishman (Elysa), Deya Justice (David), Tony Johnston (Meaghan), and Melissa Johnston; and four great-grandchildren, Jonah Dishman, Will Justice, Emelyn Dishman, and Trip Johnston. Funeral Services will be held at Walnut Hill United Methodist Church, in Dallas 10066 Marsh Lane, on Saturday, April 7, 2018 at 11:30am. In lieu of flowers, the family requests donations be made in Phyllis’s name to Walnut Hill United Methodist Church.